I want to share with you all of last seven days traffic report of my google web analytics guide blog. 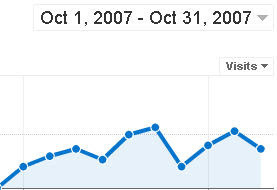 Below is the bar graph of traffic how visitor fluctuation is there on my blog. We can conclude by this graph that every day visitors may fluctuate by up and down. There are many reason of up and down so you need to bother for up and down traffic but you should continue to do your work on site or blog to attract visitor. Today I was tracking my blog stats and traffic source. When I was analyzing keywords source one of the nice and important query found. 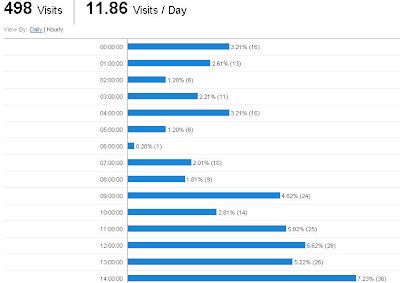 One of the visitor was searching to know "Can Google Analytics Track Time Spent On site". Answer is "Yes". Google Web Analytics help you to track this important metric to know about visitors value time spent on site. But you know what is time on site? How it can be analyse? and How is it useful? Time spent on site is an important metric of Key Performance Indicator(KPI) to check website performance. This metric is very important for e-commerce sites to know how long a visitor or audience stay on your site by attracting your offers. If your e-commerce sites offers lead generation/subscription, sign-up, buy, register etc then you can analyse to easy steps to complete and follow the forms of these services in a short period or seconds so that audience can use or have it these offers. Your visitors come to your site through three sources Direct, Referrals and Keywords. You can analyse easily which source holds visitors for how long. Which keywords is traffic driven and visitor stay a long time or short time on site. This analysis can help to target your sites keywords to hold your visitors. 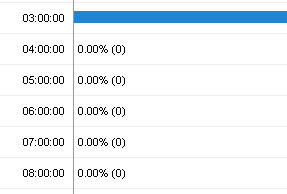 By default is google analytics shows time spent by All Traffic Sources. By over all conclusion you will find that Time spend on Site is an important key to defining metrics which you can use to help you make decisions. Let's watch an interesting video of "Introduction of Web Analytics 2.0" redefining by Avinash Kaushik on Sep 5th 2007. (3) which translates into your desired outcomes (online and offline). What screen resolution would be best for your website viewing? Do you know that how does the screen resolution setting effect your visitors? Do you know what website resolution would be best for your website viewing and building also. Many website built in 800x600 screen resolution and others in 1024 x 768. But what screen resolution would be best for your website designing and look. Generally it depends on the requirement of content and displaying products on your website. 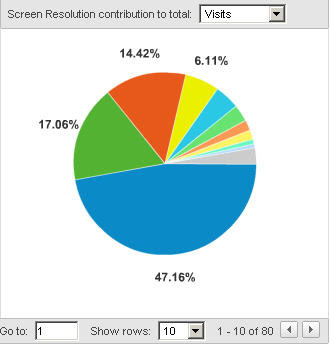 After analysis of this stats we can conclude that high screen resolutions are better to view a website. If we build out site in large width and hight we can present more content, product detail, other information on out site easily for better visitor interaction. High Resolutions makes the overall screen area large, although individual items appear small. It helps to viewers and visitors to view website and available details clearly without any disturbance. The aim of me writing this post to guide you how to track screen resolution of your site visitors. Go through these easy steps to create screen resolution report. There are many types of report can be generate through Google Aanlytics for example General Report, Monthly Report, Daily Report, Hourly Report. In this post I am going to describe about Hourly Report. This post will help you to track hourly visitor for today or current. 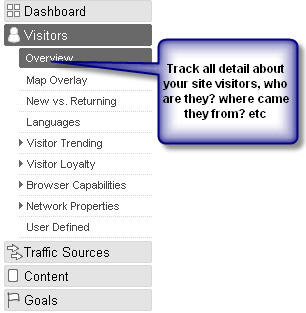 After analyzing daily visits for all visitors on you site. You wanna to see Hourly visits for all Today visitors: the actual number of unique visitors per hour for the current day. 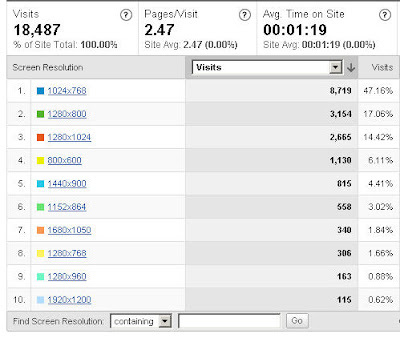 Hourly visit mean to say how many visit and visitor come to your site hourly?, what is average of hourly visitor and moving across on your site? Or Hourly Visitors by % for Week of 'Day 1' to 'Day 7': the percentage of visitors per hour as calculated from the current week. By hourly visitor report you can easily track, what time duration or hours are important for your valuable site and what hours and important for your site? In which time duration more visitor come to your site? You can also track what time the server response or other technical support what good or bad for visitors? Hourly report can help you to improve your hourly online visitors and results also. After clicking on Hourly option you will get hourly report for 24 hours as image shown above. The report tells the details for each and every hour with visit average and and total visits per hours. Look at on below image, it shows a graph for one hour and rest are no graph. If you could not see any bar in few hours like image above described, it means there are no any visitors during these hours. Plot Graph to track visits, page views and bounce rate etc. You are seeing a graph plotted on dashboard of Google analytics. You can change the graph report for visits, page views, bounce rate, Avg. Time on Site, %New Visits etc. Just you will have to click on the tab to drop down the option menu to view the graph which you want. Let see the image below, a red box marked in image, where drop-down tab is available to plot different graph. 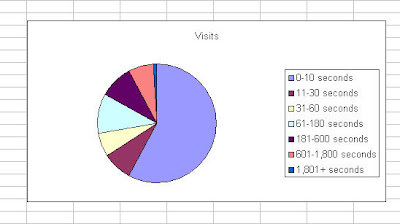 By default the graph plotted for visits. After selection of any option, graph will automatically plotted. Graph plotted datewise by default for a month only. If you put mouse cursor on graph, the date range appears automatic which tell us the record for particular date. Let see the below image. The graph describe clearly how the traffic acting on your site. You can have an idea to make your next target or plan after tracking the traffic and visit, page views, bounce rate etc by Google Analytics Graph. After SignIn in Google Analytics, you reach at Dashboard first. At right corner you see a date range of one month like this image, it a calender to select the date. This is drop down calender, you can select date for a particular date and also for a range of date like for one week or one months according to your requirement. If you will see below image, notice dark spots in middle, is a selected range for one month stats. After selection of date click on Apply Range Button, wait for a while, you will get a traffic report described throught graph and other elements.